The area around the so-called mural building north of the Memorial Traffic Circle in Kittery is intended as the site of a food truck pod. 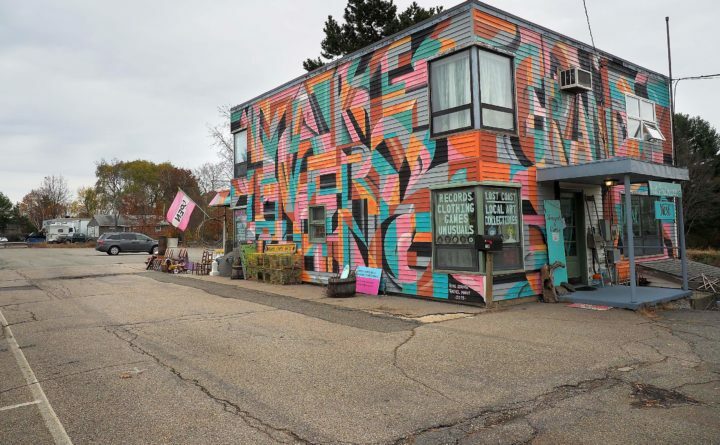 KITTERY, Maine — The Planning Board unanimously accepted a preliminary site plan application Thursday night to create a food truck pod at the “mural building” just north of the Memorial Traffic Circle. The vote pushes the proposal to a public hearing, which has been scheduled for Feb. 14. Barbara Jenny of Green Brook LLC, which owns the colorful building at 230 US Route 1 that houses Lost Coast and other creative businesses, first went before the board in November, stating they wanted to bring more life and energy to the concrete jungle that is the large parking lot adjacent to the building. Jenny and her husband were inspired by the success of Congdon’s After Dark in Wells, and wanted to create a smaller version in Kittery. At their property, they’re proposing a three truck “pod” with on-site seating at the north end of the property. The Planning Board held a site walk at the property last month and addressed some concerns about safe access, bathroom placement and clearly-divided parking spaces. Jenny said they’d made the adjustments to their plan since the site walk. They also have more than the required number of parking spaces. Thirty-one are required for the use, and they have 35. The applicant will ultimately have to go before the Town Council to be granted a victualer’s license if the Planning Board signs off on final approval.